﻿ Sothys Gommage Exfoliant Review: Is It Suitable For Your Skin? Sothys Gommage Exfoliant has marketed a granule-free exfoliating skincare treatment. Our review of Sothys Gommage Exfoliant will give you a clear picture of how this exfoliating product works and if it can really refine the skin’s texture. If you’ve never experienced a gommage skincare treatment, it’s quite unique. These types of exfoliating treatments don’t require much else other than your dry skin and the use of your own hands, no water needed. Sothys Gommage Exfoliant is a non-abrasive exfoliant that clears away dead cells on the surface of your skin to reveal a smoother, clearer looking complexion. For best results, gently apply Sothys Gommage Exfoliant to your dry skin. Smooth an even layer, about a quarter sized amount, using your fingers and work the product into the skin for up to two minutes. Allow the product to dry and then use your clean, dry hands to remove the peel in small, circular motions. You can remove any excess product with a wet cotton pad or sponge. 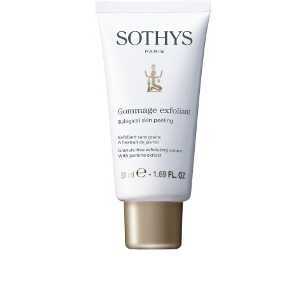 Sothys Gommage Exfoliant retails for $38.00 per 1.7 fl. oz. of product on several relatively well-known skincare retailer websites. Oryza Sativa Starch: Also known as rice starch, this ingredient exfoliates away impurities without causing irritation. This product is granule-free and won’t cause irritation. This exfoliating treatment evens out the skin’s texture and perfects the complexion overall. 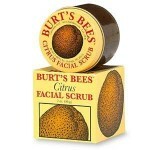 This product sweeps away dead skin and other pore-clogging impurities. This exfoliating treatment is a bit pricey, particularly for anyone on a budget. The application and removal process is messy and cumbersome. This product contains synthetic fragrance and other fragrant ingredients, which may cause irritation. Sothys Gommage Exfoliant claims that it can sweep away dirt and other impurities without causing dryness or irritation due to the fact that it is granule-free. Although this may sound like an intriguing solution for those of you with sensitive skin, there are several issues we’d like to address before you consider purchasing. Gommage masks are notoriously difficult to apply and remove. If you’re unfamiliar, this exfoliating skincare treatment goes on dry and is removed by slowly massaging the product away without water. Many customers claim this tactic is far too messy and cumbersome. 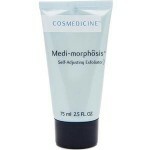 Additionally, this exfoliating treatment contains synthetic fragrance and other fragrant ingredients. 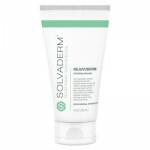 Combining these potential irritants with the exfoliating action needed to make this product work, you’ve got yourself a recipe for dry skin and adverse reactions. We’d recommend continuing your search for an exfoliating treatment that suits your budget, skips on the unnecessary fragrant ingredients, and isn’t a total mess. Sothys Gommage Exfoliant is sold on several very well known skincare websites. These sites have quite reasonable return policies. If, for any reason, you’re unhappy with the product you’ve chosen, simply return it within 30 days for a full refund. Be sure to include proof of purchase, otherwise you’ll likely receive store credit in place of a refund. While exfoliating the skin does not have to be done on a daily basis, it should be performed on a regular basis in order to keep the skin free of dead skin cells which contribute to a dull, poorly textured skin surface. With any exfoliator it is important to choose one suitable for your skin type, particularly if skin is sensitive or prone to breakouts. 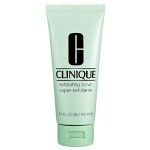 An exfoliator that is gentle yet effective, clearing the pores but maintaining moisture is preferable.